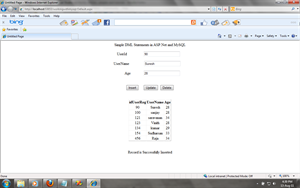 I am creating Asp.Net Web Application with MySQL Database. In this Article I am going to Explain about Select, Insert, Update and delete Operation in ASP.Net and MySQL. Display Records in Gridview from MySQL Database using DataAdapter. I am creating one ASP.NET Web application with C# using MySQL Database. MySQL Database is open source and easy to work in asp.net and MySQL Database. In this Application I am going to explain about Select, Insert, Update and Delete Operation in ASP.Net and MySQL Database. Here I am displaying records in Gridview from MySQL Database.Display Records in Gridview from MySQL Database using DataAdapter. I am creating Web application in ASP.Net named WorkingwithMySql. In this application I am using Three Textbox, Gridview, Four Button controls and Four Labels. If you want to connect Asp.Net with MySQL Database, You need install MySQL Connector/ODBC 3.51. You can Download it from MySql.com. In Solution Explorer, Right Click of WorkingwithMySql Application, Click Add Reference. In the Add Reference Dialog Box, Click the tab indicating the type of component you want to select. You can see MySql.Data, Select MySql.Data and Click ok.
Now you can Connect Asp.net with MySQL Data base. Write Below code in Web.config file Configuration Section. if you are configure the data base connection string in web.config file, you can access the connection string from all over the application.Here You want to set your Server name, Userid, Password and Data base name. You want to use MySql.Data.MySqlClient Namespace for Connecting Asp.net with MySQL Database.MySql.Data.MySqlClient Namespace contain class and method for working with MySQL Data base. MySqlConnection :it is used connect Visual Studio.Net with MySQL Data Base. MySqlCommand : It is used to execute the command in your data base. MySqlDataAdapter : it is acting as bridge between MySQL and Visual Studio.Net. MySqlConnection is class. MySqlConnection is used to connect Asp.Net with mySQL. Write Below code in Page load Event. Here Display records in Gridview from MySQL Data base. Here I creating a method SetData. SetData method is used to display records in Gridview. When you click Insert button, The Records will insert into MySQL Data base. When you click Update button, The Particular Records will update in MySQL Database. When you click Delete button, The Particular Records will Delete in MySQL Database. Thanks for this great post! it is useful for me. How to create Stored procedure in MySQL and Use in ASP.Net. create Stored procedure in MySQL is similar in SQL SERVER. I think it will help you .if you have doubts let me know.